Welcome back to Channel Chaser! Once again it’s time for a show review, and this week I’m going off the TV screen and onto the Internet. 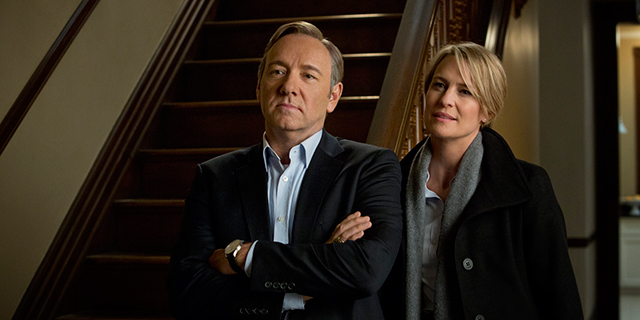 Today’s topic of examination is Netflix’s critically acclaimed drama series House of Cards. The show features a great cast and has a fascinating setting in Washington D.C., the home of political intrigue, but how does it really stack up? First of all, let me say that this show reminds me a lot of HBO’s Game of Thrones in both its premise and content­–and when I say a lot, I mean in almost every detail. Characters decide they want more power for their own personal reasons and engage in a series of complex plots and maneuvers designed to raise themselves up and destroy their opponents, no matter what it takes…is this sounding familiar to anyone? While it may not be original, the similarity is not all bad. The fact that House of Cards is set in the real world–well, more or less–versus the fantasy land of Westeros, makes the tension between the characters and the events that happen in the show hit home in a much more personal way. Sure, we can be upset about the death of our favorite GOT character or aggravated at the political landscape of Westeros that favors the ambitious and tears down the honorable, but seeing the same kinds of things happen in House of Cards makes you wonder if this really is the way things work in Washington these days. Also, at least Game of Thrones has some people I like in it. Who the heck am I supposed to root for in House of Cards? The ruthless politician who steps on whoever he has to in order to get ahead? The wife who uses her non-profit organization that supposedly does good in the world for her own selfish needs? The reporter who throws away her integrity and self-respect in order to get inside information? At least in GOT we have dependably plucky underdogs like Tyrion and Arya to hold out hope for, but in House of Cards it seems that if anyone makes a mistake, they’re finished forever. Again, not necessarily bad, but just frustrating. I must admit, however, that the characters are the main draw of this show. In particular, Kevin Spacey shines as the menacing and merciless Frank Underwood–which pretty much figures, since he’s the star of the show. If you read my last article on TV’s best villains, you’ll understand why Frank is such a fascinating figure to me. I find myself simultaneously hoping he gets caught and brought to justice, but also hoping that he gets away with it just one more time so that we can see what he’s really capable of. He is clearly not a good person and doesn’t really think of himself as one: he’s just a total pragmatist who’s going to do whatever it takes to get what he wants, and Spacey captures his alternatively cold and charming character in true Usual Suspects style. Plus, we get cool little tidbits like the Freddie’s BBQ connection that shows us that despite all appearances, Frank is still a human being with similar tastes and vices to the rest of us. I’m a little confused about Frank’s motivations, though. Why exactly does he want power again? Oh, right: because he was annoyed that someone else took his job. So where did the presidential ambitions come from? No clue. Unless they were there from the start–which I really don’t think that they were–the whole thing kind of comes off like a politician’s temper tantrum. Except that when Frank Underwood gets mad, he doesn’t scream or throw things, he just undermines the government of the free world. I guess you could argue that Frank’s desire for absolute power was always there and that his passing over for Secretary of State just accelerated his plans, but this should have been clarified in the show. I’m also not sure how I feel about Spacey’s heavy use of addressing of the viewer directly. Breaking the fourth wall is not normally something that is done in fiction, and when it is, it is usually a technique that is used sparingly because it can get cheesy very quickly. I have always been of the belief that we learn much more about a character by watching what they do rather than what they say, so in some ways Frank’s self-narration seems like a cheat to make us like him more or to fill out his character in a convenient and easy way. Granted, there are a lot of times where I laughed at Frank’s blunt analyses and enjoyed the obvious divide between what he tells others and what he really thinks, but I have to question where this idea to consistently break the fourth wall came from in the first place. And another thing: how in the world does Frank always know how people are going to react to everything? Before you say anything, yes, I understand that the whole point of the show is that things didn’t always go according to Frank’s plan and that he had to act on the fly several times to put things back on track, but it seems to me that any normal human being would have stumbled over the intricate web of lies Frank spins half a dozen times before the first episode was over. The ending of season two felt especially forced to me: Frank writing a personal letter to the President to get back in his good graces and convincing him to turn on his long-time friend Raymond Tusk seemed way, way, way too good to be true. It was a Hail Mary play that should never have worked. Yes, I understand that it’s a work of fiction. Yes, I understand that leaps of faith are required in pretty much any show to really get into the plot. 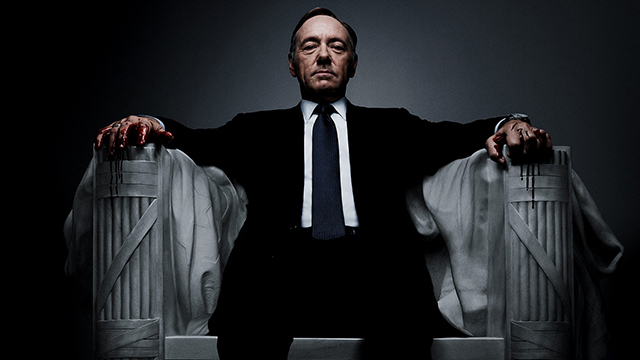 But seriously, is Frank Underwood like another Jim Moriarty or something? Because it seems to me that only a superhuman intellect­–and maybe not even that–could have accounted for all the variables in this complex human equation. Okay, so I should probably score this show lower due to all the complaining I’ve just done about it. But the fact is that from the moment I started watching House of Cards, I was addicted in a very similar manner to my Game of Thrones obsession. Despite all the holes present in the plot, the characters are just so engaging and the story so filled with twists and turns that it’s almost impossible to get enough, and that’s what it takes for me to give it a pass on some of its larger flaws. Don’t let me discourage you from watching House of Cards, because it is most definitely a good show that never fails to entertain and astonish. I just can’t help but think that with a little more care and attention to its setup and methods of storytelling, it could have gone from being a good show to an extraordinary one.